The Royal Victoria Hotel, originally built in 1828 as the focal point of Burton’s St Leonards, derives its name from Queen Victoria who stayed at the hotel. 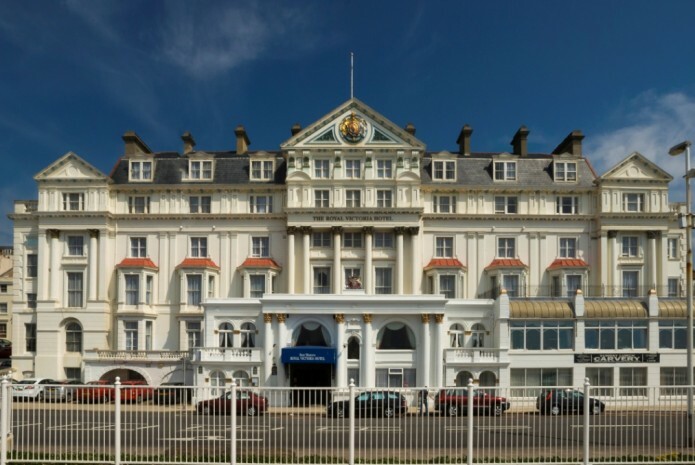 Situated in a prime position on the seafront in St Leonards-on-Sea, the hotel offers you a comforting mixture of traditional hospitality, friendly atmosphere and all the modern conveniences you would expect from Hastings’ landmark hotel. As soon as you step through the revolving doors you'll appreciate that you've arrived somewhere special; a hotel with both character and warmth. Following a typically genial welcome by our Reception team, the rare charm of our period marble staircase will hopefully catch your eye as it leads up to the Piano Bar & Lounge and its panoramic seafront views, all before settling in to the spacious and quirky elegance of our bedrooms. This uniquely characterful AA 3-star accredited hotel houses 50 sizeable bedrooms, 2 bars, several functions rooms as well as our popular Sea Terrace Restaurant, so whether you're visiting on business, for an event or enjoying a leisure break the Royal Victoria Hotel is here to cater to your every need. Our mission is to make your stay as pleasant as possible, as proven by our growing reputation for friendly and helpful staff, so we look forward to welcoming you!